Since Formula 1 returned from its summer break, Red Bull have engaged another gear and are dominating in a fashion very similar to 2011. Up and down the pit lane, people have been trying to work out what they have done to gain such a big advantage. Sebastian Vettel has won every race since the Belgian Grand Prix at the end of August - that's five in a row - and he is expected to dominate again in India this weekend and probably for the rest of the season. There has been speculation about traction control, which we have dismissed here, and about clever engine mapping helping maximise the downforce-producing effects of the exhausts. Without doubt they push everything in this area to the limit but that is there for everyone to do. They have also incorporated a few small developments in various areas and a redesign of their diffuser. I think their advantage lies in the way they are exploiting the overall design of their car. Red Bull's aerodynamic concept is all about running a lot of rake on the car - low at the front and high at the rear. A typical F1 car will run 20mm front ride-height and 70mm rear ride-height when stationary. But the Red Bull is typically 5mm lower than that at the front and 10mm higher at the rear. But it is hard to make the car work in this trim. It's difficult to ensure the front stays low at slow speeds because of the leeway needed to stop it grounding too much at high speeds, when the massive aerodynamic forces on the car produces downforce which pushes it towards the track. And it's also very difficult to keep the diffuser working well at high rear ride-heights - with the increased height a lot of air can leak into the diffuser from the sides, reducing its overall performance. But Red Bull use the exhaust gases and their sidepod design more effectively than any other team to 'seal' the diffuser and keep the airflow working through this under-floor area. I think most of Red Bull's improvement is related to the reversion to the 2012 tyre construction that was forced on Pirelli after the multiple failures at Silverstone and how this interacted with their overall car concept. The 2012 construction tyres grow at high speed, which raises the car away from the track. From about 100km/h to 300km/h, the tyres grow by about 5mm in diameter. This lifts the front ride-height of the car by half of that amount. That allows the teams to lower the front ride-height of the car by that amount. Doing so means that not only will the under-floor produce more downforce but the front wing performance will be enhanced as well. This change in ride-height is a lot when it comes to an F1 car and its ability to produce overall downforce. However, it will not work for everyone. The aerodynamic configuration of every car is different and some cars will not produce as much of a performance improvement as others. The tyres that were introduced at the beginning of this season, and which had to be abandoned after Silverstone, had a stiffer tread profile and did not grow at speed anywhere near as much as the current tyre. So before the tyres changed, Red Bull could not take as much advantage of their philosophy of running the front of the floor as low as possible as they could since the 'old' tyres were introduced. So, summing it up, the tyre change has gone hand-in-hand with the Red Bull's design concept to create the improved performance. If you were watching the BBC over the Japanese Grand Prix weekend, you may have seen me highlighting something that had become apparent from the thermal-imaging cameras that were mounted on the Red Bull. This camera pointed rearwards from the side of the nose to the forward part of the underfloor and showed that the front part of the floor under the driver's legs - what is known in F1 as the 'tea tray' - was getting hot at relatively low speed. Is this the secret to Vettel's success? This is unusual, because F1 cars have a 'plank' made of high-density wood mounted along the length of the floor to control ride height. If this wears by more than 1mm over a race distance, the car is disqualified. Normally, if the plank is touching the ground at the speed the Red Bull was doing, this would lead to it wearing too much in the race. The plank is protected by skid plates but they are limited to a maximum surface area which is quite small and it is actually this component that we see getting hot. I think I have worked out another potentially very clever tweak that Red Bull might just be exploiting. Every car has a 'stay' between the raised bottom of the chassis and the tea-tray to ensure the floor can pass the FIA's mandatory upwards deflection tests, which are in place to stop teams designing the floor to be flexible in that area. But if the floor can be made to 'flex' upwards as the car increases in speed then it will give an aerodynamic advantage because it allows teams to run the car lower overall. If Red Bull have found a way to lift the 'tea tray' away from the track as it gets hot, that will enable them to run a lower front ride-height at low speeds, and will mean a more constant gap from the 'tea tray' to the ground through a wider range of vehicle speeds. Normally, that would not be possible, because the extra downforce created as the car speeds up would push the car down and wear the plank too much. HOW COULD A TEAM ACHIEVE THIS? I believe that a team could set up the brackets that attach the floor to the stay in such a way that when the floor and front skid area gets hot, it moves the floor up and away from the track, whereas most bracket designs I have seen in the last few years actually do the opposite and would move the floor towards the ground. It's difficult to get a clear view of the Red Bull floor bracket, but the car certainly has a much more complicated arrangement of parts at the front of the tea tray than seems necessary, and the mechanics spend a lot of time in the evenings around that area of the car. To exploit this area in this way, the brackets would be made out of aluminium or another material which expands quite a lot as it gets hotter. There could also be a linkage that has a ratio on it to increase that movement. As the unit heated up the floor would move away from the ground - one millimetre movement upwards as opposed to one millimetre downwards would allow the car to be set up with two millimetre lower front ride-height, which could improve lap-time performance by somewhere in the region of 0.2-0.3 seconds. This way, the increase in tyre diameter and the upward movement of the front of the floor together would allow a team to keep the car lower to the ground for longer periods. If Red Bull were doing this, the overall performance gain would be quite large, perhaps 0.5-0.7secs and come from being able to exploit their initial car concept to the maximum. The combination of both could explain why Red Bull have suddenly leapt forward in competitiveness. But how would the car pass the load tests in the pits if the floor flexes? Simple - it doesn't move when the FIA load is applied as all the brackets are metal and mechanically connected together and when the bracket has cooled down the floor is back to its original flat state. As the tests take place some time after the car has been out on the track, there would be no problems with either of these tests. Basically it is rigid at all times, it only moves when it is heated up out on the track. So if Red Bull are exploiting this, as I suspect they might be, they could afford to run the floor low at low-speed so it is touching the track at, say, 100 km/h and it would stay at more or less the same height right up to 300km/h through a combination of the bracketry for the stay allowing the floor to lift up, moving the floor slightly upwards and the tyres also increasing in diameter. The others cannot simply copy it, because the whole philosophy of the car has to be designed this way from the beginning to make it work. If they do use something like this it's merely another example of Red Bull being ahead of the game in identifying what they want the car to do, and thinking laterally to find unusual ways of making it happen. 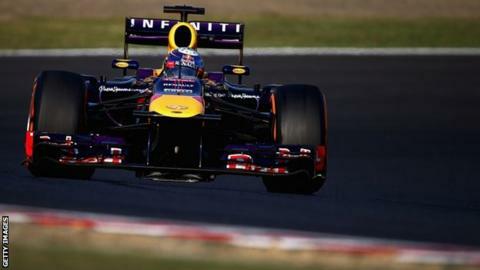 Read more on Formula 1: Is this the secret to Sebastian Vettel's success?